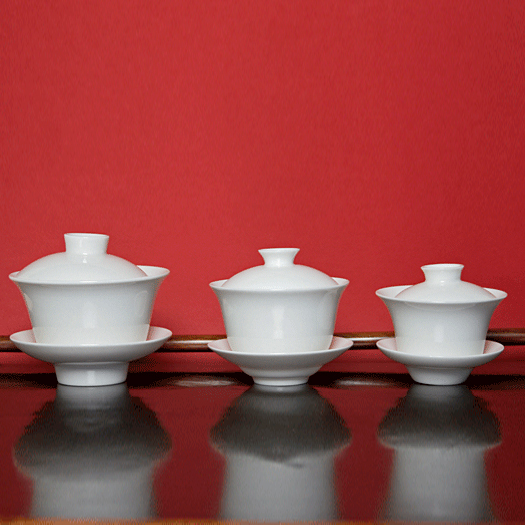 8.45 oz / 250 ml capacity Gaiwan: SOLD OUT! Bone china is a very special type of porcelain. Because of its exact clay formula, bone china is finer, more elegant, thinner-walled, lighter in weight and more translucent than some porcelain. Many consider bone china gaiwans (and porcelain, too) to be the most perfect material for steeping all types of tea. Bone china and porcelain is fired at a high temperature in the kiln, so the glaze bonds with the clay and does not ride on the surface as it does with some ceramics. This gives bone china and porcelain durability, thin walls and elegant shapes that are light in the hand. These bone china gaiwans are as practical as they are beautiful. Because they are fully glazed, they will not retain the taste or aroma of previous tea – a quick rinse with warm water is all that is needed when steeping different types of teas in succession. Nor will bone china influence the taste of the tea that you are steeping as the glaze imparts no flavor. When you are finished using your gaiwan just give it a quick rinse and allow it to fully dry before putting it away.